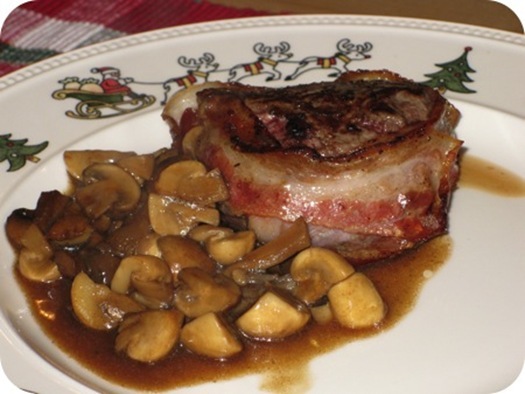 In the following recipe of beef steak with mushroom sauce, chef Zakir used mushrooms, one of my favorite thing to eat. Mushroom contains high fiber and essential B vitamins. It is a good source of vitamin D and low in saturated fats. One thing keeps in mind that always use canned mushrooms, never try to pick it yourself, as there is a risk that you can pick the toxic ones, which are not good for your health. In a bowl add garlic ginger paste, black pepper, salt, lemon juice, mustard, and oil. Mix it well till it forms a paste. Now add Worcester sauce in this paste. Marinate steaks in this paste and set it aside for few hours. Now fry or grill the steaks until they are done. In a pan take 4 tbsp oil and fry the onion, when it turns brown add 2 cup water. Dissolve flour in a little water and add it in onions, stir continually till the mixture thickens. Add mushrooms and cook for 2-3 minutes. Pour the mushroom mixture on steaks. Serve hot. recipe looks is so delicious and yummy! this recipe is very easy.Thanks for sharing the whole recipe.